Painter Louise Camille Fenne was born in Copenhagen, Denmark in 1972. She studied in France and Denmark before enrolling at The Florence Academy of Arts in 1995. 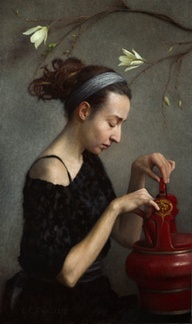 Since 1999, she has lived in Denmark and shared a studio with her partner and fellow painter, Charles Weed. 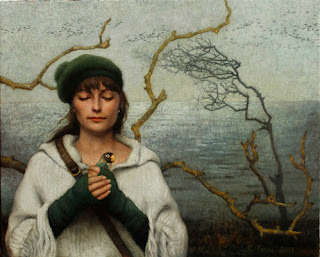 I am intrigued by her paintings, most especially the bird ones. 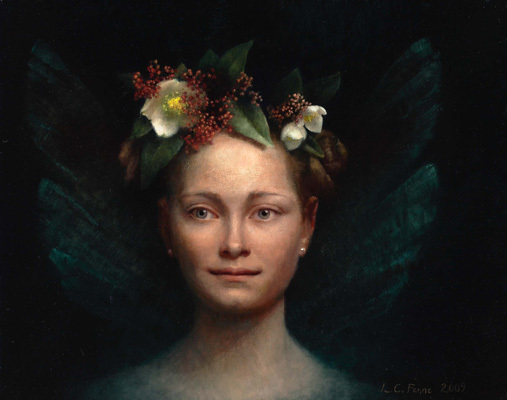 There's something essentially mysterious about Fenne's work. Something we can only guess at. The way she uses color is part of it, but also the way she sees. Her sense of design is excellent as well. 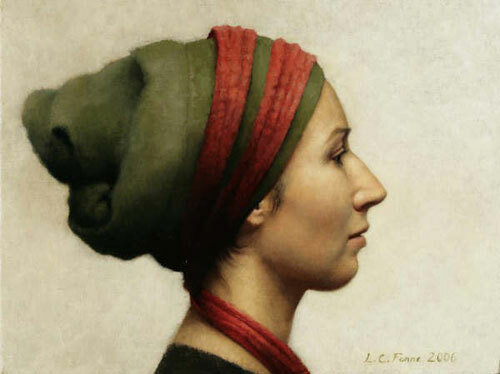 To see more of contemporary artist, Louise Camille Fenne's work, please utilize her website. There's also this short video on youtube. 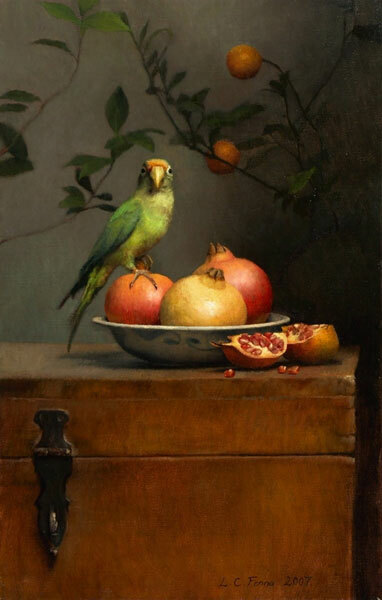 Beautiful paintings, Yvette, especially the one where the parrot is perched on the pomegranates — very realistic. Thanks for sharing these. I really enjoyed going to the website and seeing the range of Fenne's work. My favorite might be Mid-Winter (Figures in landscapes). 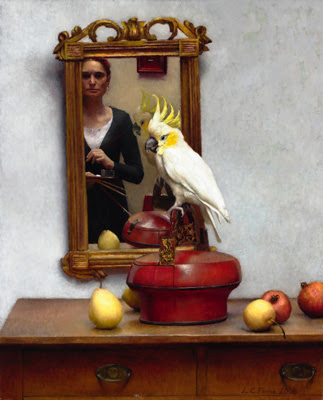 Her works are so exquisitely detailed, especially her still lifes on her web site! 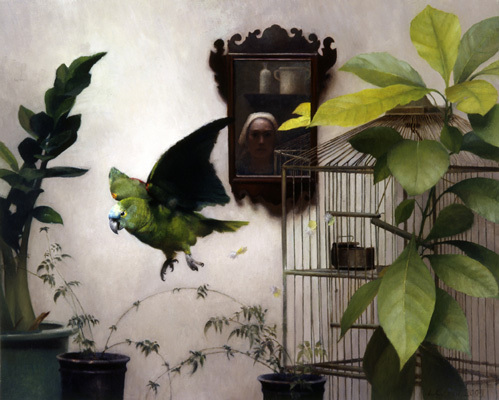 Some of the paintings make me think of Frida Kahlo, maybe the exotic birds and flora with the solitary woman. They're lovely pictures. I'm not a fan of modern art, so I'm always excited to see a young painter who actually paints pictures (I'm such an infantile artistic admirer!). Interesting. 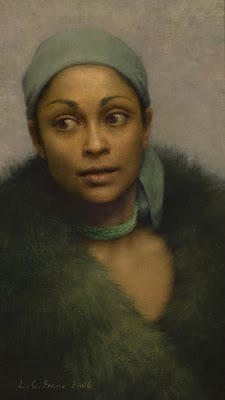 The artist, being a young woman, gives a contemporary feel to her art. When I looked at it, I knew she was a painter today. The art also reminds me of Frida Kahlo in mood, but not totally, as Kahlo's artwork was so full of objects and detail. You're welcome, Prashant. Glad you appreciate them. I found this artist while looking for another. Serendipity. 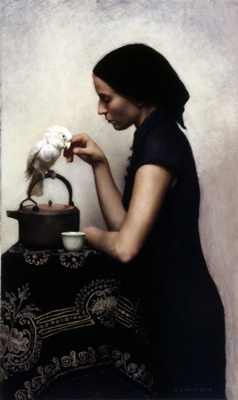 Mark, while I like all her work, I am especially fond of the profile portrait at the top of the post and of course, those mysterious birds. Yes, she has a beautiful website. I'm glad you took a look, Pat. Frida Kahlo had a lot of pain expressed in her paintings. But I don't sense that in Fenne's work. Just maybe some dark mystery. Kathy you're the second person that mentioned Frida Kahlo's work. I didn't even see that myself. But that's one of the things that makes art so personal. What each of us perceives in a given work. That profile at the top of the post, and in fact much of Fenne's work reminds me of the european paintings that were called Orientalism. Yes, I think so too, Mark. But still with an element of mystery that many of the Orientalist paintings lacked. Oh! She's a genius with faces. 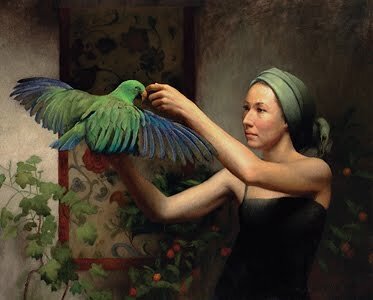 But I agree - the parrot & fruit is the most beautiful!